Speicher Health Products. Natural Remedies that really work! After Popular Treatments FAIL. Infections, Allergies, Vision Problems. Almost all toothpastes are abrasive. This can slowly wear down the enamel. Serving the Amish for over 18 years. When other remedies FAIL, try Speichers. These famous Amish remedies have already helped many. Give them a try. Tired of suffering? You came to the right place. No guarantees. But certainly worth a try. All health claims are medically unproven. Important. Before you take any natural remedy, always check with your medical doctor. There are no magic pills that work all the time for all people. These are unproven, unorthodox, natural remedies that are based more on folklore than science. All health claims are medically unproven. 100% Natural Amish Health Products. Excellent for the Teeth & Gums. An old-time remedy. No Dental Problems. 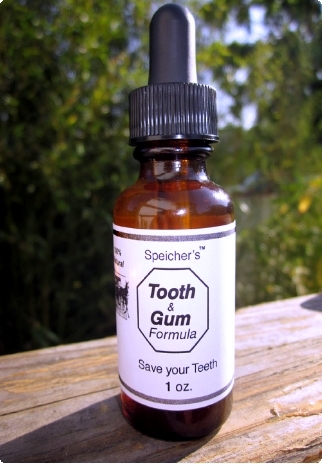 ‘I have been taking this Tooth Formula for over 20 years -- and never had a dental problem.’ -- Matthew Wood. God created the perfect tool to keep teeth clean. It's called the Miswak stick! Speicher Health Products often work -- after popular remedies FAIL. 100% natural. We have about 1,500 customers. Many have improved their health using Speicher Health Products. Many of these people got results -- after the best medical and nutritional treatments failed to work. Miswak has been used for thousands of years -- to clean & polish teeth. Plus to prevent cavities and gum problems. It's time to wake up -- and stop using American Toothpastes.